Heinberg is good company as he describes the coming Armageddon; the financial collapse is not an aberration to be fixed but the end of civilization, as we know it. Heinberg is good company as he describes the coming Armageddon; the financial collapse is not an aberration to be fixed but the end of civilization, as we know it. He expertly details the three reasons why: resources are running out; environmental impacts are approaching tipping points and debt-based economics fail under the inevitable strain of sagging confidence. Given the perennial problem of increasing population growth compounded by increasing consumption I don’t need to be convinced, I wanted to more rapidly get into exploring the post-growth world. Heinberg has to be thorough because he remains a marginalized voice drowned out against the braying of politicians and media who perennially obsess over increasing growth even as the impossibility is writ large in the world around us. Heinberg laments that governments want to return us to “a life of carefree motoring through anonymous suburbs” even whilst every day that passes and every gallon of fuel burnt is wasted if it is not preparing us for Peak Everything; the steady decline in supply of the nutrients of the conventional economy. From now on, to maintain and improve our quality of life, we need to be able to take care of ourselves and our loved ones without depending on mega-corps shifting the fundamentals of life (energy, food, water) around in the giant mechanical web of fossil burning machines which has, for this brief moment in history, become ubiquitous. 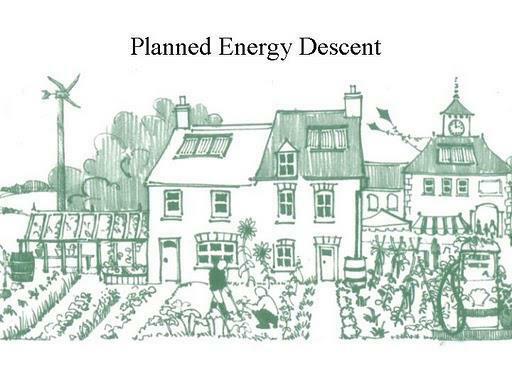 Heinberg demonstrates that investing now in renewable energy, low carbon food production, and local resilience could avoid catastrophe but acknowledges that governments and business, trapped in short-term planning cycles, may drive ‘business-as-usual’ over the precipice of collapse. 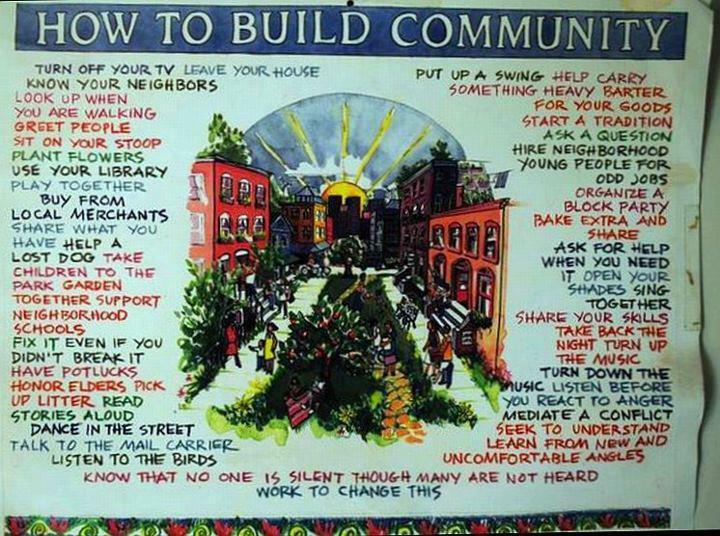 This is why he wrote the book “to prepare individuals and communities for what is coming”. The job of the informed minority is to have the tools, knowledge and seed ready to enable survival once our centralized, fossil fuel infrastructure splutters to a halt, and yet grass-roots, pre-emptive action should surely spread. 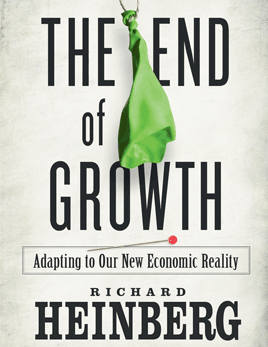 “The end of economic growth does not necessarily mean we’ve reached the end of qualitative improvements in human life.” Indeed, according to Heinberg the single most important thing any of us can do to prepare is to go and meet our neighbors “the people you may need to depend on”. This is also one of the easiest and most successful actions we can take to improve our well being. The number of neighbours we know is closely correlated to our happiness levels. Heinberg cautions early on that his message may be bleak and yet I relished the realism and found hope in the later sections. At a time of ubiquitous debt, surging unemployment, slashed social welfare, and when nature’s agonies are muffled only by dismal and desperate, endless and empty calls for more; problems whose solutions require restraint, community building and a recalibration of quantity over quality my turn out not to be problems at all. 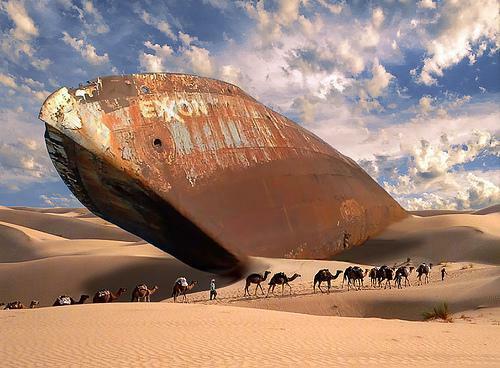 Our planet is beautiful but limited couldn’t our economy be the same? . .